This photograph of an exhibit at Angel Island State Park shows a note left by a Japanese prisoner of war (POW), and a panel translating the note to English for park visitors. The POW wrote the note on the wall before he returned to Japan on November 7, 1945—two months after Japan surrendered. This detainee had previously been at Fort McCoy, Wisconsin, another prisoner of war camp. During World War II, Angel Island housed Japanese, German, and Italian prisoners of war, some of whom were detained for almost the entire war. Additionally, Japanese Americans from Hawaii were temporarily housed in the dormitories at Angel Island before being sent to internment camps. West coast Japanese Americans deemed dangerous by the US government were imprisoned in the US Army camp on another part of the island, before being sent to detention centers like Fort McCoy rather than internment camps with their families. 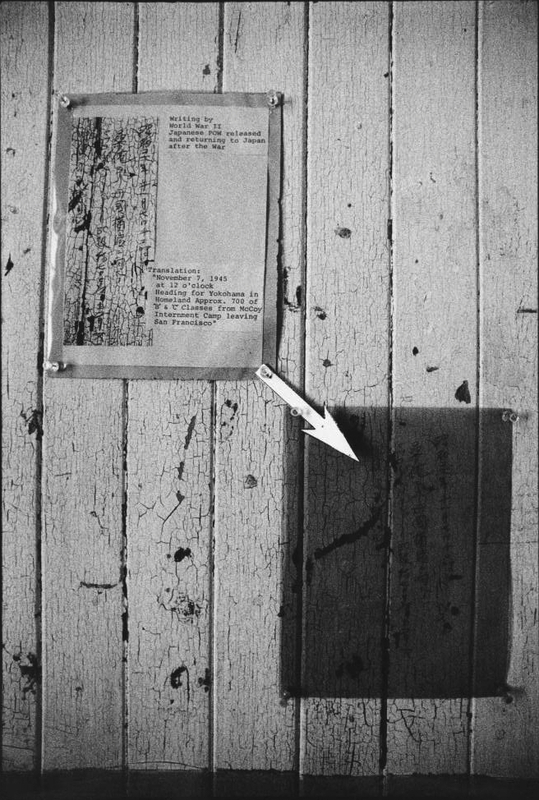 Berndt, Jerry, “Note written by Japanese POW, released and returning to Japan, November 7, 1945, Angel Island, Detention Center, San Francisco Bay, San Francisco, California, 2003,” Digital Public Library of America, https://dp.la/item/547b066c889fdd84341e2c0c1ba7a101.